When I first went to Daytona Bike Week 30 years ago, you could still get into a fistfight for riding the “wrong” motorcycle to the “wrong” bar. I’ve been going to Daytona ever since and I’ve seen change like I never thought I would. These days, everybody rides what they like and there seems to be harmony. A couple hangs out during Daytona Bike Week, watching the unique and unusual. Photo by Bill Andrews. This year, a cold and overcast day launched the 74th Daytona Bike Week, the grand ol’ rally that started with a race on “the world’s most famous beach” and was dedicated to speed. Today, not so much speed… but more on that later. First the good stuff. A young rider on a heavily modified old Kawasaki. Photo by Bill Andrews. As part of that spirit of everyone riding what they like, it’s great to see young people embracing, building and modifying bikes into older-looking, bobber-style machines. It seems history really is bound to repeat. These bikes are very stripped and simple, hiding or eliminating everything that isn’t needed to make the bike go — very reminiscent of what WWII GIs did upon returning home. At the AMCA meet, an ingenious air cleaner… maybe. Photo by Bill Andrews. The owner wants $40,000 for this 1913 Thor. Photo by Bill Andrews. This interest in the styles of the past may also explain why the older bikes’ prices are going through the stratosphere. At the Antique Motorcycle Club of America meet in New Smyrna, about 15 miles south of Daytona, a 1913 Thor had an asking price of $40,000 and Harley Knuckleheads were commanding $80,000 and up, which made it all the more amazing to see Phil Cusmano riding one that he had turned into a true mudder bike with big, fat tires with aggressive tread. Phil Cusmano calls his modified Knucklehead the Massey-Davidson. Photo by Bill Andrews. The variety of riders at Bike Week has grown, too. Women are a major segment of that growth, but I’m also seeing more minorities saddling up, and again, mixed groups were all were riding and hanging out together—cool! At the Cabbage Patch, server Paula tries to keep warm on a cold and wet first day of Bike Week. Photo by Bill Andrews. Bartenders come up with an interesting game during Bike Week, a sort of treasure hunt where the first one to bag all the items on the list wins. Photo by Bill Andrews. Though Daytona remains the hub, activities have spread out to cover a much wider swath across the middle of Florida. Out at the Cabbage Patch, a bar so remote it’s named for the crop that was grown on the land it sits upon, I find a nice mix of old and new motorcycles from around the world — with an obvious slant towards Harley-Davidson. A very cold Paula and Bella are serving beers to a fairly sparse crowd on the chilly first day of Bike Week. To keep things interesting, they’ve devised a sort of treasure hunt with other barkeeps. Check everything off the list and you win. What catches my eye is an item labeled “stab wounds.” It’s checked off. Tomoka Park is a popular day ride. Photo by Bill Andrews. Admittedly, the flat and straight roads around Daytona and Central Florida aren’t known as a top location for sporting riding. But up the road is a fairly nice ride through Tomoka Park. It leads through a tunnel of trees that eventually opens up to a great ride along a pristine beach still unobscured by buildings and such — rather rare along any coast, anywhere. Want to get away from the crowds for a ride along the beach? We recommend Route A1A in Flagler County. Photo by Bill Andrews. A paraglider gets an aerial view of Bike Week. Photo by Bill Andrews. About 20 miles north of Daytona on Route A1A in Flagler County is the Snack Jack, a quintessential beachside hangout featuring cold drinks, hot fritters and endless ocean views. There, I find another interesting trend. More folks are including their pooches in their travels. On a sunny Sunday, Tracy and Debb have brought their four-legged friend, Chloe, to Bike Week from Michigan. They’ve been coming for three years now because “the weather is so much better than Michigan,” says Debb. Chloe was one of the biker pooches enjoying Bike Week. Photo by Bill Andrews. At Destination Daytona, S&S Cycles had a rather large display of one of their engines. Photo by Bill Andrews. Inland from Flagler lies Destination Daytona, the sprawling dream of the late Bruce Rossmeyer. More motorcycling mall than dealership, the place includes restaurants, shops, condos and hotels. 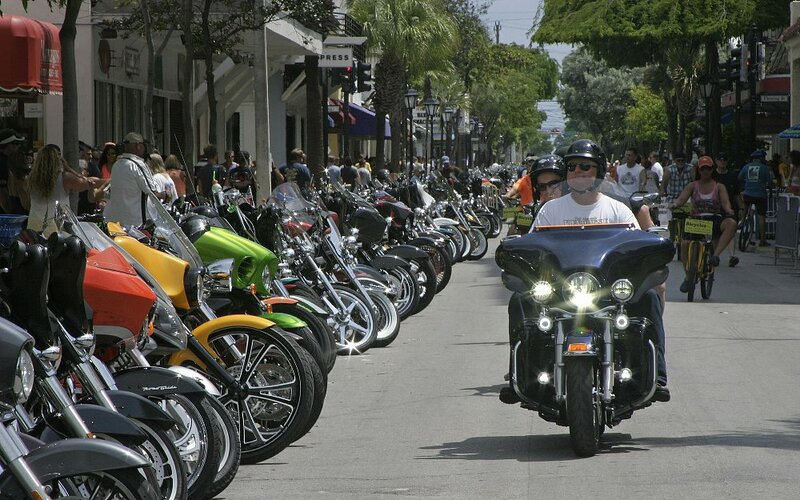 During Bike Week, they really pull out the stops and the place takes on a carnival-like atmosphere, with multiple events, vendors, and music playing all week. The Main Street scene, framed by a chrome wheel. Photo by Bill Andrews. Beware of sharp objects on this chopper. Photo by Bill Andrews. Back in Daytona, Main Street is the epicenter of activity, the place to go to see and be seen. A constant parade of various machines and people flows both directions. When you think you’ve seen it all, something unexpected comes along, like a guy on a bicycle carrying three parrots and a cockatoo. A different kind of rider at Bike Week. Photo by Bill Andrews. Serious musician, I can tell. He then goes on stage and performs a rather good rendition of “I Walk the Line.” Booze must help. Main Street, Daytona: where everyone goes to be see or be seen. Photo by Bill Andrews. Trikes seem to be gaining popularity. They also provide a rather large canvas for artists. Photo by Bill Andrews. Trikes of just about every configuration and style have also taken up a larger share of tarmac real estate. Love ‘em or hate ‘em, I’ve noticed they do offer up a relatively large canvas on which to put artwork, like a beautiful tropical scene labeled “Chillin” I found on the back end of a Boss Hoss on Beach Street. At the Speedway, vendors and manufacturers cover the parking area around the 2.5-mile tri-oval. All the major manufacturers are present, most offering demo rides. An old Indian rests as a newer Yamaha rolls by in Flagler. Photo by Bill Andrews. Vendors showcase everything new for 2015 at the Speedway. Photo by Bill Andrews. Racing used to be the grand dame of Bike Week, the main reason manufacturers and riders came. Thank goodness Supercross is still a big draw. But, unfortunately road racing has become a rather silly joke. The once prestigious Daytona 200 has been reduced to essentially a club race. Sadly, we may be seeing the end of the historic race that started all of this. A classic Vincent Black Shadow spotted on A1A up in Flagler. Photo by Bill Andrews. But, I have faith in our young and up-and-coming riders. From what I saw, I think these guys and gals will keep motorcycling going strong well into the future. And who knows, maybe somewhere down the line we’ll even see the speedway holding another great road race again. Younger riders join the Main Street parade. Photo by Bill Andrews.